Workshop 3 on Sunday starts as planned at 13:00 – 16:16, WS4 17:15 – 19:30. Park Hotel Kekava has made an offer for tango dancers: 20 Ls (ca. 30€) per room including breakfast (to be served 10:00 – 11:30…..). The price is per room, no matter if 1 or 2 persons stay there. Additionally they have family apartments with 2 rooms for maximum 4 persons (2 single beds and 1 dbl bed) for 30 Ls (45€). Booking at Park Hotel Kekava with reference to TANGO (info@hotelkekava.lv, Director Ljudmila Titova). Lesson 2. TANGO FOR BEGINNERS. Fundamentals of tango. How to understand the feeling of Argentine tango dance culture. Lesson 4. TRICK AND PAUSES. TRICK. How to walk/use one simple short left step, and how much it changes the feeling for the partner. PAUSES. How to play, how to do, how to enjoy. The leaders managements/standings. The followers standings. Why the pauses are so important for us. Lesson 5. MILONGA FOR BEGINNERS. Fundamentals of milonga. Funny game. This time Tango Port Tallinn really represents a PORT for tango people. We invite you to different places near the port: to milongas in the middle of seagrass, dancing IN THE BOTTOM OF THE SEA on Sunday – in a fairytale under boats and next to a real submarine! Live music is played during Friday, Saturday and Sunday concert-milongas. The artists include musicians from Estonia (Kirill Ogorodnikov – guitar, Jekaterina Danilova – accordion/bandoneón, Nele Suisalu – vocals), Quinteto Ángel from Germany (with Christian Gerber on bandoneón who played both in Trio and Sexteto Stazo Mayor at Tango Port Tallinn 2011) and duo Aires de Finlandia – Petri Kaivanto (Finland) & Alejandro Polemann (Argentina). Milongas are DJ-ed by DJ Kaia Hüva, DJ Kaja Keil (both from Estonia), DJ Nemanja Sonero (Serbia). 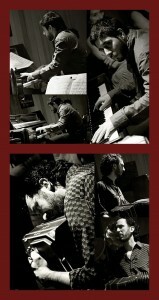 21:30 – 02:00 Milonga, DJ Andreas, Germany. Show of the teachers. *** Separate room costs extra 10€ for a person. registration fee by 1 July. ** There will be baby-sitter. Fee – 5€ / per day / per child. when registering for the camp. Laura and Andreas are living and teaching Tango in Berlin (www.tangotanzenmachtschoen.de). They are dancing “Tango de Salon” in a very musical way, playing with rhythm and melody, creating an authentic tango-atmosphere. In their classes they put the focus on a comfortable joyful dance with a delightful contact in the embrace, which gives room to various improvisations, away from the mere memorizing of steps. Luis & Miria have started their Argentine Tango life 7 years ago after 10 years of practice in standard ball dances. Their passion is milongas. Luis and Miria has developed their own waltz and milonga laboratory idea, where they explain the different patterns of rythm. dances and teaches different tango styles, incl. tango nuevo. Juergen dances Argentine tango for 8 years. good sense of humour and he is good at explaining the essence of the movement. Juergen regularly travels to different tango festivals and follows the latest trends of tango. Liene is a psychotherapist as well as an art, body and movement therapist. She has obtained her knowledge from the leading specialists in body and dance therapy in Russia and France. She dances Argentine Tango for 5 years and explores the elements of tango in therapy. 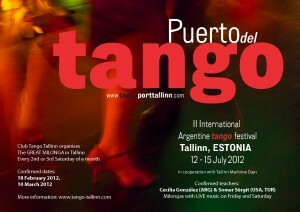 The 2nd international Argentine tango festival in Tallinn. The milonga on 30 March in the frame of the Tango Baltica weekend with Diana & Juan will be hosted jointly by El Naranjerito and HiCentrs. It will take place at HiCentrs, Maskavas str. 1, Riga centre. Starting at 22:00, and ending at 2:00 or later depending on your dancing mood. DJ Lena. Please take some snacks (finger food) and / or some wine with you along. Price: 2 Ls. Midsummer Tango 2012 is 3rd edition of the event (2nd in “marathon format”). 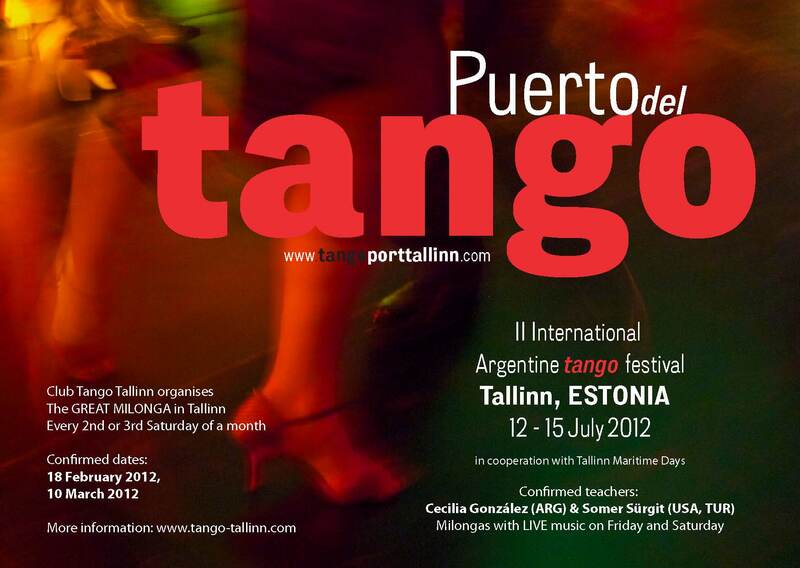 Pls visit www.midsummertango.lt for more info about Midsummer Tango 2012 which will happen June 21-24, 2012.